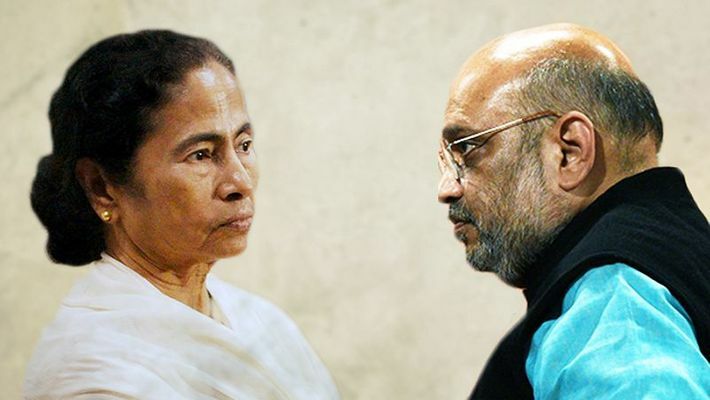 Bengal: BJP president Amit Shah on Tuesday said that the Trinamool government is targeting BJP workers because they are opposing Bengal chief minister Mamata Banerjee’s corrupt rule. Speaking at a rally in West Midnapore, Shah slammed the Mamata government, accusing it of corrupt practices and said that there is a chance to turn Bengal into Sonar Bangla in the 2019 Lok Sabha elections. “We have to change the government in Bengal,” Shah said, remembering revolutionary Kshudiram Bose and Bankim Chandra Chatterjee. “The ADM (additional district magistrate) of this district was transferred last night (Monday). Transfer whomsoever you want, the BJP will restore democracy in Bengal,” Shah said. Every fifth person in Bengal is below the poverty line. “How many of the closed 55,000 factories did you restart?” Shah questioned Mamata. The Left had perpetuated poverty and unemployment. “Mamata added syndicate to it,” he said. “Will the Ponzi scheme operators get caught if the chief minister is not changed? Around 2.5 million people lost their hard-earned money in Ponzi schemes,” the BJP chief said. More than 65 BJP workers were killed in Bengal, Shah said. “Bengal decided to go with Narendra Modi in 2014 and uproot the Mamata Banerjee government. Will the TMC be able to stop infiltration and cow smuggling? If BJP comes in power, forget infiltrators, even a bird can’t cross the borders,” Shah said. Bangladeshi infiltrators have become the vote bank of the TMC, he said. Only the Modi government will be able to make Bengal free of infiltrators, Shah added. “If Durga and Saraswati puja are not held here (Bengal), will they be held in Pakistan? BJP karyakartas will ensure that Saraswati Puja and Durga Visarjan is celebrated on a large scale,” Shah assured the crowd. “Mamata is changing names of schemes launched by the Prime Minister,” Shah said. He slammed the CM’s refusal to fund the Ayushman Bharat scheme. “She stopped funding it since she was afraid that it will encourage people to vote for Modi,” the BJP president said. In Bengal, one has to pay bribes to get any service — from birth certificates to admission in colleges, from getting jobs to old age pension, Shah said. “Do you want a government of dealers or a government of leaders? The Centre has given Rs 4 lakh crore to the Bengal government. But did this money reach the villages? The money has gone to the syndicates,” Shah said. Amit Shah lashed out at the Congress and TMC on dynastic politics. He said that after Mamata, her nephew is waiting in the wings. “I would like to ask Mamata ji if she will support the Citizenship Amendment Bill in Rajya Sabha. Tell that to the people of Bengal. They welcome infiltrators and Rohingyas but there’s no place here for refugees who came to save themselves. I would like to tell all refugees in Bengal that BJP and Narendra Modi government will grant them citizenship,” Shah said.